WELCOME TO DISCOUNT CENTRAL ONLINE. 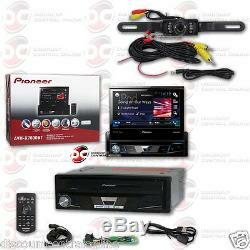 7-inch Motorized Touchscreen Single DIN Multimedia CD, DVD, MP3, USB Receiver with Remote, Pandora Link and Bluetooth. PEAK Power: 50 watts x 4 channels. RMS Power: 22 watts x 4 channels. CEA2006: 14 watts x 4 channels, <1% THD. Built-in Bluetooth technology for hands-free talking and audio streaming. Siri® Eyes Free for iPhone® 4s or newer. Features the responsive, powerful and intuitive NEX user interface. Dual Bluetooth connection allows for two phones to be connected simultaneously. MP3 ID3 Tag Display (Title/Artist/Album). 7 Flip-out TFT Active Matrix Driving Display. On/Off Dimmer Setting & Brightness Control. 13 Background, splash screen displays. Resolution: WVGA, 800 x 480. Signal to Noise Ratio: 91dBA. Dimensions (chassis): 7-1/8" W x 2" H x 6-1/4 D. Effective display area: 6-1/8" x 3-3/8". For Android devices running operating system 4.0 or later. Connect and listen to music stored on a device, without the need for an app. To use an Android Device for Control of Pandora and/or Spotify, consider the Pioneer AVH-X2800BS. Compatible with Apple iPhone 6/6+ and iOS 8+ software. IPod/iPhone with Lightning Connector requires standard USB to Apple Lightning connector. Available Sources: Audio, Pandora, and Spotify. The Pioneer CD-IU201V will take up both the 3.5mm Input and USB Input. Available Sources: Audio, Video, Pandora, Spotify, and AppRadioOne. 24-bit Digital to Analog Converter. 3.5mm Rear A/V Auxiliary Input. 7 preset equalizer curves: S.
Bass / Powerful / Natural / Vocal / Flat / Custom 1 / Custom 2. ±12 dB Gain at 50 Hz / 80 Hz / 125 Hz / 200 Hz / 315 Hz / 500 Hz / 800 Hz / 1.25 kHz / 2 kHz / 3.15 kHz / 5 kHz / 8 kHz / 12.5 kHz. Selectable-Point High-pass Filter and Low-pass Filter. (Standard mode, see Manual for "Network Mode"). HPF: 50 Hz / 63 Hz / 80 Hz / 100 Hz / 125 Hz / 160 Hz / 200 Hz. LPF: 50 Hz / 63 Hz / 80 Hz / 100 Hz / 125 Hz / 160 Hz / 200 Hz. +10 dB to -24 dB variable gain. Selectable Crossover Slopes: -6 dB/oct, -12 dB/oct, -18 dB/oct, -24 dB/oct, OFF. Adjustable time alignment, subwoofer control and listening position selector. 3 Sets of 4V preamp outputs (front, rear and subwoofer). Dedicated Backup Camera Input: Used for universal rear view cameras with an RCA composite input. Rear RCA Video Output: Used for connection to separate monitors and other devices. Rear RCA Video Input: Used for connection auxiliary A/V devices to headunit. Car Water-Proof and Night Vision Camera. Screws, bass knobs, plastic coverings, protective films, etc. All DOA (Dead on Arrival)/ Defective items must be reported within 48 hours after receiving the item. When ordering for a Car Alarm Replacement remote make sure you are ordering the correct one or give us a call to check if it is compatible with your Car/ Car alarm. Physical damage: Item is scratched, torn, wet, burned, blown, signs of misuse, and faulty installation DEFECTIVE or non DEFECTIVE. Factory sealed items: If its opened and tampered except for certain items. The item "BRAND NEW PIONEER 7 FLIP OUT CAR DVD BLUETOOTH STEREO FREE LICENSEPLATE CAMERA" is in sale since Tuesday, February 09, 2016. This item is in the category "Consumer Electronics\Vehicle Electronics & GPS\Car Video\Video In-Dash Units w/o GPS". The seller is "discountcentralonline" and is located in Los Angeles, California. This item can be shipped to United States.